A Russian passenger airliner crashes in a remote mountainous part Egypt's Sinai Peninsula 23 minutes after taking off from a popular Red Sea resort, killing all 224 people on board, including 25 children. A Russian passenger airliner crashed Saturday in a remote mountainous part Egypt's Sinai Peninsula 23 minutes after taking off from a popular Red Sea resort, killing all 224 people on board, including 25 children. The cause of the crash was not known, but two major European airlines announced they would stop flying over the area for safety reasons after a local affiliate of the extremist Islamic State in Iraq and Syria group claimed it "brought down" the aircraft. Russia's transport minister dismissed that claim as not credible. Almost everyone on board the Airbus-A321-200 operated by the Moscow-based Metrojet airline was Russian; Ukraine said four of its citizens were passengers. Russian officials did not give a specific breakdown of the 217 passengers' ages and genders, but said 25 were children. There were seven crew members. A civil aviation ministry statement said the plane's wreckage was found in the Hassana area some 70 kilometres south of the city of el-Arish, in the general area of northern Sinai where Egyptian security forces have for years battled local Islamic militants who in recent months claimed allegiance to ISIS. The ministry said the plane took off from the resort city of Sharm el-Sheikh shortly before 6 a.m. local time for St. Petersburg in Russia and disappeared from radar screens 23 minutes after takeoff. Egyptian Prime Minister Sherif Ismail toured the crash site and later told a Cairo news conference that 129 bodies had been recovered. Photos from the site released by his office showed the badly damaged sky blue tail of the aircraft, with the Metrojet logo still visible. In the background, heaps of smouldering debris dotted the barren terrain. "I now see a tragic scene," an Egyptian security officer at the site told Reuters by telephone. "A lot of dead on the ground and many who died whilst strapped to their seats. "The plane split into two, a small part on the tail end that burned and a larger part that crashed into a rockface. We have extracted at least 100 bodies and the rest are still inside," the officer, who requested anonymity, said. One photo showed a member of the search team holding the flight recorder, or black box, which Ismail said would be scrutinized as investigators try to determine what caused the crash. Russian investigators were expected to arrive in Egypt on Sunday. Natalya Trukhacheva, identified as the wife of co-pilot Sergei Trukachev, said in an interview with Russian state-controlled NTV that her husband had complained about the plane's condition. She said a daughter "called him up before he flew out. He complained before the flight that the technical condition of the aircraft left much to be desired." My deepest condolences to the families of passengers on the Russian charter flight that crashed today in Egypt. One Egyptian official, Ayman al-Muqadem of the government's Aviation Incidents Committee, said that before the plane lost contact with air traffic controllers, the pilot had radioed and said the aircraft was experiencing technical problems and that he intended to try and land at the nearest airport. It was impossible to independently confirm whether technical problems were to blame, and no other Egyptian official repeated the claim on Saturday. In a statement on its website, Metrojet said the A321-200 aircraft was in good shape and that the pilot was experienced. It identified the captain as Valery Nemov and said he had 12,000 hours of flying experience, including 3,860 in A321s. Russian Transport Minister Maxim Sokolov said officials from Moscow and Cairo were in touch over the incident. The Egyptian officials, he said, had not confirmed the claim by ISIS militants who said they "brought down a Russian plane over Sinai state with more than 220 Russian crusaders on board." The militant group did not provide any evidence to back up its claim. "Based on our contacts with the Egyptian side, the information that the airplane was shot down must not be considered reliable," Sokolov said, according to a report by the Interfax news agency. "We know what it looks like if a plane has been shot down. It won't be shot down at 20,000 or 30,000 feet [about 6,100 to 9,100 metres] by a shoulder-fired surface-to-air missile. But we know as we found in Ukraine with [Flight] MH17 that there are people who have vehicle-carried missiles that could achieve that altitude," former military pilot Jock Williams told CBC News. "And if we know that ISIS or ISIL is working out there, they could have imported something," Williams said. "It's not a good likelihood, but a possibility. But we will know very quickly because the wreckage will contain evidence of the impact of a surface-to-air missile. They're very distinctive." An English-language statement issued by the office of Egyptian President Abdel-Fattah el-Sissi spoke of Russian leader Vladimir Putin commending the efforts made by authorities in Egypt "to uncover the circumstances surrounding the incident." But two major European airlines — Germany's Lufthansa and Air France — were not taking any chances. Both announced Saturday they would immediately stop flying over Egypt's Sinai Peninsula for safety reasons until the cause of the crash was determined. Their aircraft would take alternative routes to reach destinations in the region. Spokeswomen for the airlines spoke anonymously in line with their respective companies' regulations. Egypt's foreign minister, Sameh Shukri, warned "foreign" countries that he did not identify against taking measures that reflect speculations on the cause of the crash. "That will impact the Egyptian economy and lead to damages. These nations must consider this as well as their relations with Egypt," he said. 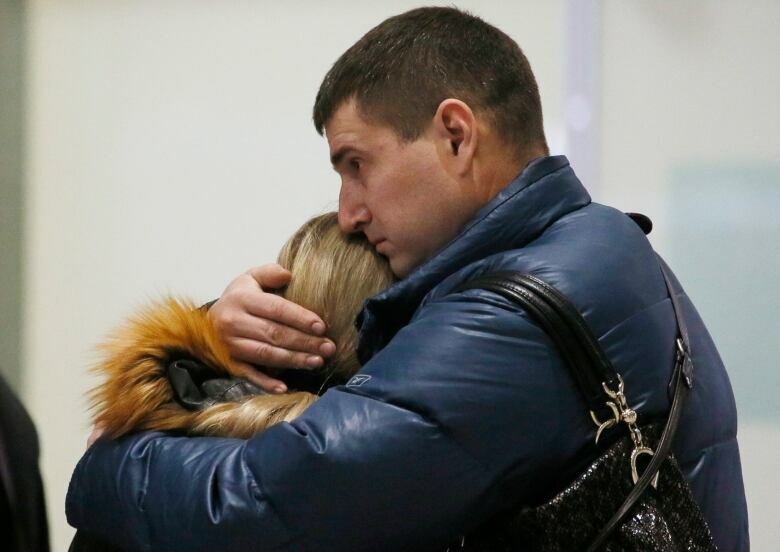 Friends and relatives of the crash victims were gathering Saturday at a hotel near St. Petersburg's Pulkovo airport. Psychologists were meeting with them in a large conference room off the lobby and police kept journalists away. Some left the room occasionally, looking drawn with tear-stained faces. "She was a very good friend who was ready to give everything to other people. To lose such a friend is like having your hand cut off," Zaitseva said, adding that Rodina's parents feel "like their lives are over." Russian airlines became infamous for poor safety in the early years following the 1991 collapse of the Soviet Union, which caused severe financial troubles and regulatory disorder. Although accidents have diminished in recent years, crashes persist, many of them blamed on human error. According to Russian news agencies, the flight was chartered by the St. Petersburg-based Brisco tour company. The plane was made in 1997 and has since 2012 been operated by Metrojet.